A self-contained enclave centered around its lovely namesake feature, Meadow Park offers residents a charming, scenic setting to call home. Neighbors meet in the rain garden and stroll paved walkways that weave gracefully around the perimeter. 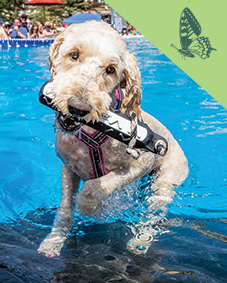 A playground in the center provides hours of entertainment for children, and a very popular Bark Park allows your canine companions a safe place to play off leash. View Meadow Park site plan now. Another example of listening closely to our customers, The Woodlands at Meadow Park was created following requests for a high-quality, single-family home at a great price. These bungalow-style homes are coastal-inspired, featuring cool, breezy exterior color palettes complemented by shingle and metal roofs, and two-car garages. The new neighborhood welcomes you with beautiful curbside appeal, front-porch living and green spaces for neighborhood enjoyment. 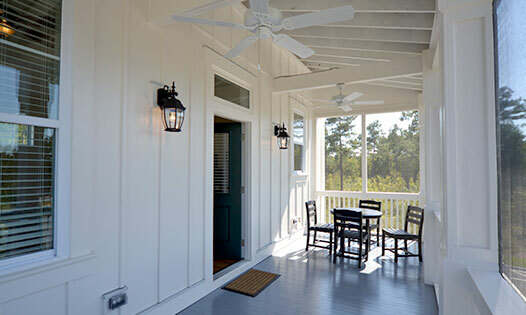 Charm is an essential element of these single-family homes, where cozy front porches, plank siding, metal roofs and other elements evoke a coastal cottage aesthetic from an earlier part of the 20th century. While the roots of the traditional design originate deep within the coastal South, these elevated homes also feature contemporary amenities and conveniences. Among those attracted to The Cottages at Meadow Park are active pre-retirees and retirees looking to downsize from their current home. There’s also a strong second home market, which is especially appealing to buyers seeking rental income. 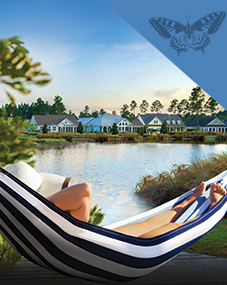 Located in Meadow Park at Brunswick Forest, these coastal cottage homes are close to the Fitness and Wellness Center, as well as the community’s medical, professional and retail center, The Villages at Brunswick Forest.